My parents had an afternoon of dim sum planned, but after visiting a family friend, it was already 2:30 p.m. and much too late for dim sum. 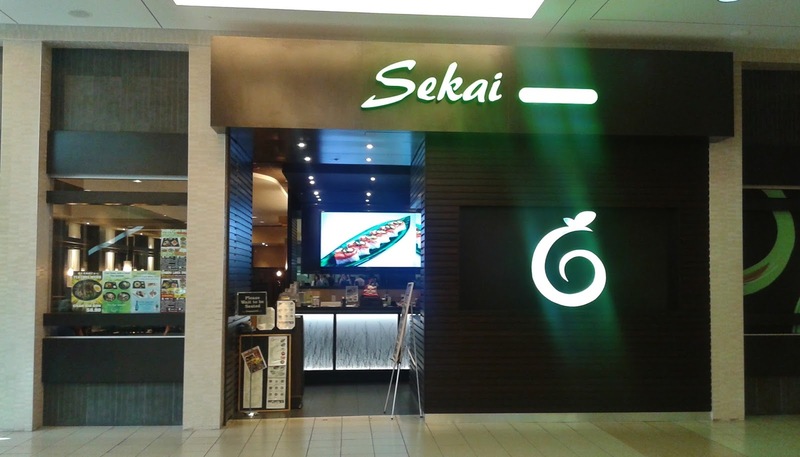 Of course, I seized the opportunity to turn the afternoon into a sushi adventure instead by suggesting Sekai Udon Bar at Metrotown, to which everyone agreed. 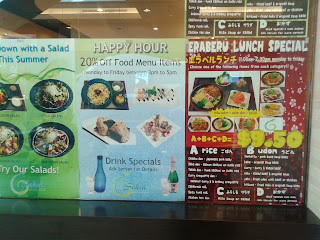 I was in luck because as soon as I got to the restaurant, I saw a sign advertising 20% off all food items from 3 to 5 p.m. from Monday to Friday! This meant that I could unleash my desires and order everything that looked good to me on the menu. Oh wait... if I did that, I would probably need to use all the tables in the restaurant. Anyways, since we arrived a little early, I spent a few minutes entertaining myself with the meow critters in the pet shop next door. Sekai Udon Bar is Chinese-operated, and the interior of the restaurant is quite spacious. However, the restaurant was nearly devoid of customers despite the significant Happy Hour discount. The menu had a large assortment of udon and sushi items, but before I even finished reading the first page, my mom had already unleashed her desires instead and planned out our whole order. I scrambled to write down the names and descriptions of everything that she ordered into my notebook, but by the time I finished writing, there were already three dishes on the table (the food came out surprisingly fast). Then, by the time I finished taking photos of everything that had landed on our table, the Japoutine was almost all gone. My head was spinning before I even started eating! 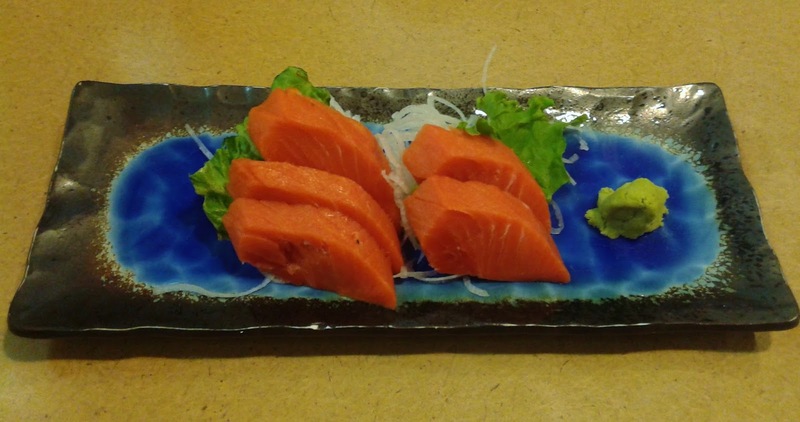 The first item to arrive was the five-piece Wild Sockeye Salmon Sashimi. From the photo, it is evident that the knife skills were rather crude. The sashimi was soft, but it was also weak in flavour and not the freshest I've had. 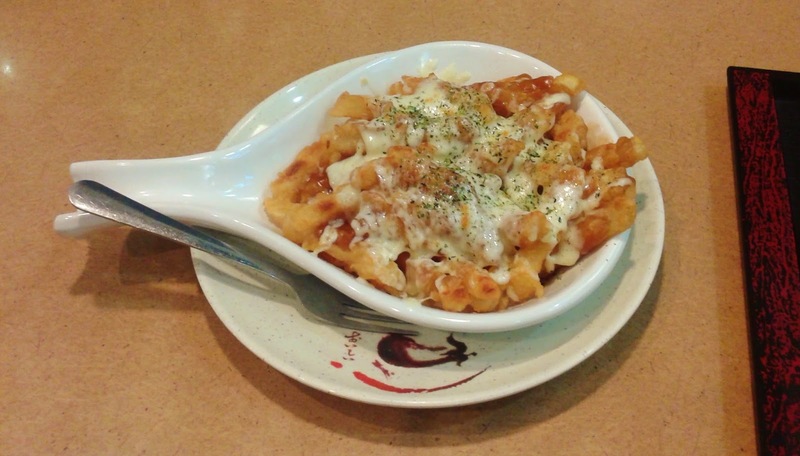 Garnished with cheese and seaweed powder, the Japoutine was the tastiest item of the meal. The fries were large, crispy on the outside, and soft and moist on the inside. My dad and my sister kept eating the Japoutine like there was no tomorrow, but at least they left a few fries for me to sample. 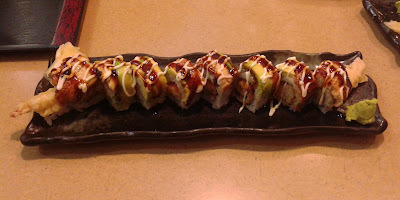 The Dragon Roll consisted of prawn tempura, unagi, avocado, tobiko, mayonnaise, and unagi sauce. The unagi was sweet and savoury, and there was a nice crunch from the tobiko. The batter on the prawn tempura was a little hard, but overall, there was a nice harmony of flavours. The Atlantic Salmon Oshizushi smelled really good when it arrived, and the dish was noticeably heated. There was a fairly large amount of rice under each piece - or so it appeared. I looked a bit more closely and saw that there was a large piece of ginger sneakily hidden inside the rice! As a result, the oshizushi tasted quite discordant even though the seared mayonnaise on top was delectable. 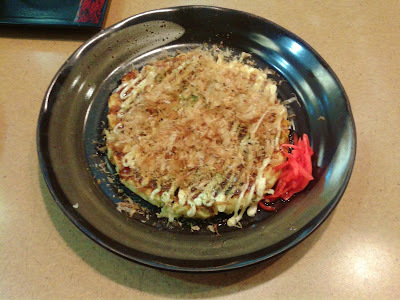 The Okonomiyaki was especially soft in texture. There was a good mixture of mayonnaise and Worcestershire sauce. However, my dad couldn't get used to the tangy flavour of the Worcestershire sauce, so I got to have half of the whole Okonomiyaki. 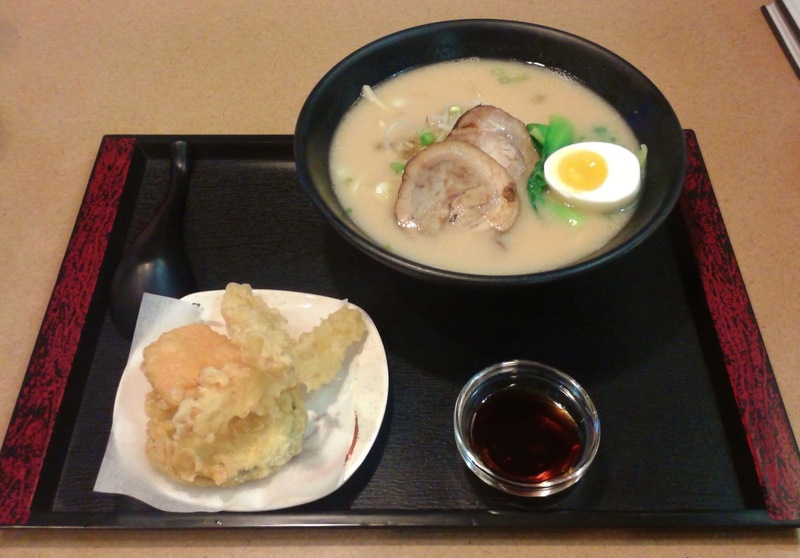 Finally, we got the Tonkotsu Udon (pork and chicken bone broth with chopped green onions, bean sprouts, and baby bok choy) with a side of Tempura. The udon noodles are freshly made in-house every day and had a relatively soft texture. The pork was tender and its flavour was nicely absorbed by the udon broth. The Tempura came with two prawns and one piece each of yam and zucchini. The frying oil was good, but I found the batter a bit thick. The flavours were preserved well, and there was enough juiciness in each piece. The service was efficient and friendly, and the food came out very quickly, but perhaps this was because there were virtually no other diners in the restaurant. Thank goodness the dining tables were on the larger side, or we would have to start putting stuff on the floor! Overall, we found the food decent, especially for a mall restaurant. 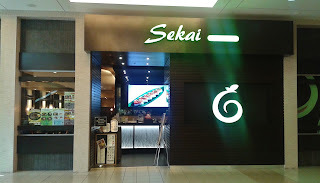 If I needed to have sushi in Metrotown, I'd much rather eat here than at Kawawa Japanese Restaurant. I didn't get to try Sui Sha Ya before it closed down, but I'm glad I missed out on it if it was really bad! Haha Selina, it's okay. 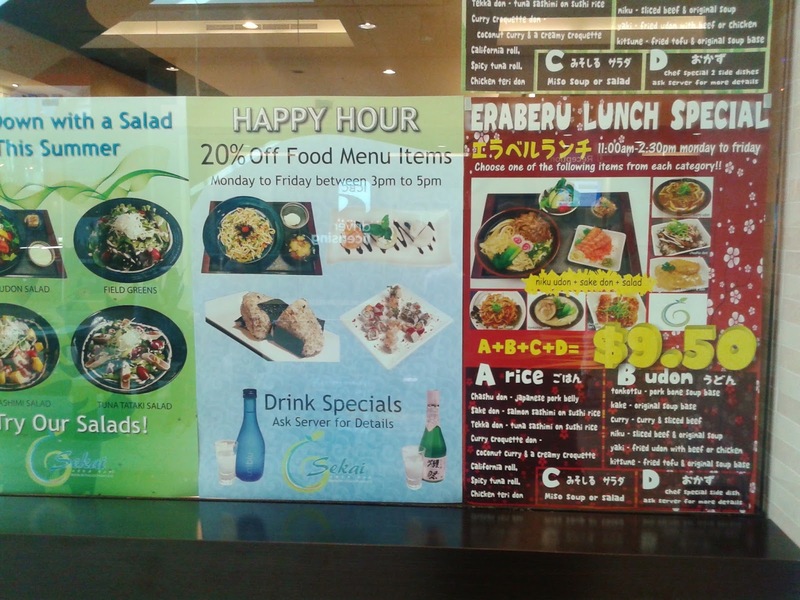 I used to go to Taisho on a weekly basis from when it opened to when it closed (around 2009). Almost the entire staff there knew me by name! Obviously, quality wasn't my main concern back then. Yes, the cheese did make the Japoutine really delicious!